extravagant Chinese wuxia martial-arts productions (e.g. Hero, 2002; House of Flying Daggers, 2004; and Curse of the Golden Flower, 2006). 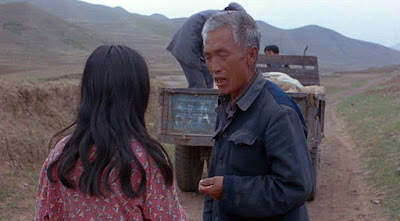 All of them have their artistic merits, but one of the best of them all was the naturalistic Not One Less (Yigè Dou Bù Néng Shao, 1999), which was based on Shi Xiangsheng's 1997 story "A Sun in the Sky". Filmed on location in a rural village in Hebei province and in its nearest metropolitan center, Zhangjiakou, which is a city of roughly 800,000 people about 180 km northwest of Beijing, Not One Less was shot entirely with inexperienced amateur actors whose real-life identities matched the roles they played. 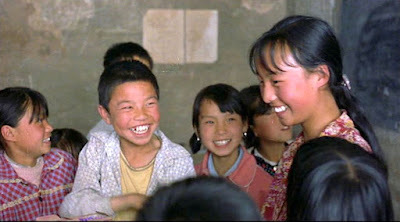 This was the first Zhang Yimou film to receive government support and endorsement , and in connection with this backing, the film’s critical reception was initially affected by some critical concerns over the degree to which it was a vehicle for the Chinese government propaganda . Perhaps due to these concerns, Not One Less was not admitted into the 1999 Cannes Film Festival prize competition. Indeed, many of the early reviews of the film focused on sociopolitical aspects of the story, which I think is a misguided view, and I would agree with Zhang’s assertion that the film is apolitical . What this film does cover, as does most of Zhang Yimou work, are universal aspects of human existence – and that is what gives it its trans-cultural appeal. It did go on to win the Golden Lion (the prize for best film) at the 1999 Venice Film Festival, and it has received numerous critical plaudits [3,4,5,6]. The story of Not One Less is about a teenage schoolteacher whose naive and stubborn efforts to solve a problem she runs into grow to reach epic proportions. Along the way, the teacher’s pupils, the people she encounters, and even the teacher, herself, are transformed by the modest and relentless sincerity of her persistence. The rewards of holding fast to the pursuit of your goals is one lesson conveyed in this film. But ultimately the film also does have something profound to say about human society. It vividly demonstrates that (even naive) faith in human cooperation through direct engagement can work wonders for all concerned. And in fact this is the greatest and most rewarding lesson that a teacher can give to her students. The narrative of Not One Less progresses through five phases of the earnest schoolteacher’s quest. At the outset, 13-year-old Wei Minzhi (played by Wei Minzhi) is installed as the temporary substitute teacher at the tiny Shuiquan village one-room primary school (1st – 4th grades). She is to substitute for the elderly Teacher Gao (Gao Enman), who needs to go away for a month to attend to his dying mother. 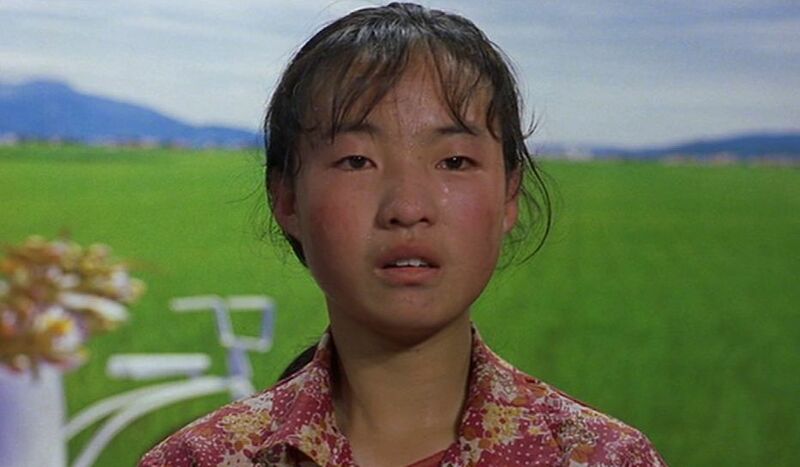 When Teacher Gao sees how youthful and unprepared Wei Minzhi is – she hasn’t even gone to highschool – he protests to the village mayor (Tian Zhenda). But the mayor replies that given the poverty in the area, this is the best he can come up with. So resignedly, Teacher Gao tells the new teacher just to assign the students the daily task of copying down Chinese characters from the class instruction book and to be careful not to waste chalk used for the class chalkboard. He also tells her that a major school problem is students dropping out – at the start of the school year, they had 40 students, and now they are down to 28. He will give her a 10-yuan bonus to her 50-yuan overall salary if she can get through her month without losing any more students. “Not one less!” he sternly tells her before departing. When Wei Minzhi begins teaching, it is clear that she is completely in over her head. The class is unruly and ignores her hesitant and timid remarks. In particular, the class troublemaker, 11-year-old Zhang Huike, boldly challenges her authority. In an ensuing class scuffle the teacher’s desk is overturned, and much of the precious chalk is crushed underfoot. So Wei Minzhi orders the class to do their copying assignment and then leaves them by themselves and sits outside guarding the door to prevent any of the students from running away. It is evident that her main concern is not providing good instruction but instead just ensuring that the class size is “not one less” so that she can secure her bonus money. Soon, however, Wei Minzhi is alarmed when a public sports official arrives at her school to recruit her fastest running girl student to enrol in a sports academy. Mayor Tian assures Teacher Wei that this departure won’t threaten her bonus money from Teacher Gao, but Wei is not taking any chances. She hides the student away from them. 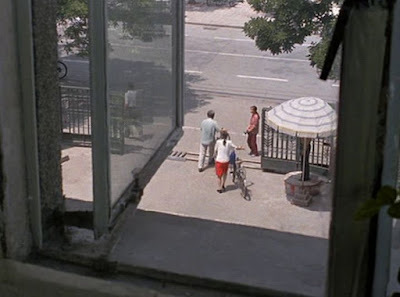 However, Mayor Tian bribes the naughty Zhang Huike to reveal where the athletic student is hiding, and the athletic girl is taken away (without getting permission from the girl’s parents, by the way). It is evident here that money is a driving force for both Wei Minzhi and Zhang Huike. Shortly thereafter, Teacher Wei comes into her classroom to see that Zhang Huike has impudently seized a girl classmate’s diary and is reading aloud to the rest of the class her expressed concerns about the crushed classroom chalk and the general unruly tenor of the class. Wei is moved by these words and forces chief culprit Zhang Huike to apologize. This is the first time that Wei has looked at things from beyond her own selfish interest. The next day, however, Zhang Huike is missing from class, and Wei learns that Zhang’s ill and indebted mother had ordered him to go to the city and find work. Now Teacher Wei’s class size is down to 26, and she realizes she is not living up to her promise to Teacher Gao to sustain the school. From here on Wei’s altruistic instincts begin to dominate. She resolves to go to Zhangjiakou and fetch the boy so that he can continue his education. However, Mayor Tian refuses to fund Wei’s trip expenses to go Zhangjiakou, and Wei realizes that she will have to find her own means to get there. So she consults her class for help, and this is where the film makes a beautiful turn. Although Wei is naive and inexperienced, when she works with the class in pursuit of a noble goal, they all share what little they know and learn from each other. Teacher Wei and her class become a team, and this is, in fact, the best way to learn. After pooling their knowledge, they conclude, wrongly as it turns out, that a bus ticket to Zhangjiakou would cost 3 yuan, so Wei would need 9 yuan to go there and bring back Zhang. Wei suggests that the class further pool their resources by each contributing 50 cents, yielding a total of 13 yuan. 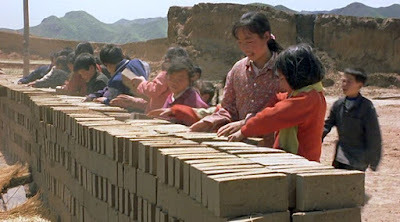 But one of the students reports that they can collectively earn the money by moving bricks at the local brick factory. So the class “team” joyfully rushes off to the brick factory and enthusiastically shift 1,500 bricks for storage. The brick factory manager is not happy with this work, but when he sees their eager persistence, he donates 15 yuan to the class. Now with a surplus of 6 yuan above their presumed required trip expenses, Wei takes her class to the local store to drink some Coca-Cola. One can of Coke costs 3 yuan, and this gives the viewer an idea of just how puny are the sums of money under consideration. With only two cans of Coke available for them, the class again goes into collective sharing mode, with each student taking a couple of sips. When they all go to the bus station, though, they learn that a one-way ticket to Zhangjiakou actually costs 20.5 yuan, so Wei doesn’t have enough money. But she won’t give up. After trying (at the class’s suggestion) unsuccessfully to sneak onto a bus, Wei winds up walking and hitchhiking all the way to Zhangjiakou. In the big city there are lots of people, but they are only connected by rules and mechanical protocols. Wei tracks down a middle-school student, Sun Zhimei, who had come to the city with Zhang also looking for work, but it turns out that the girl had lost track of Zhang upon arrival in the train station. At a cost of 2.5 yuan, more than Sun’s daily wage, Wei enlists her support to help her find Zhang. They spend a long time looking around the train station, but their efforts are fruitless and Sun goes back to her own work. a newspaper ad will be too small to be noticed. Her only hope, he tells her, is to go to the TV station. Although the TV station is a bus ride away, Wei is now broke and walks all the way there. So Wei arrives at the hub of our modern-day dream of human connectedness: electronic media. The TV station is fenced off and has an admission gate, and when Wei tries to enter, the gate attendant tells her that she needs prior permission and an ID. This is another example of how our modern efforts at human connectedness are rigidly restricted by rules and protocols. The ever-persistent Wei keeps trying but gets nowhere, and finally the exasperated gate attendant tells the penniless girl that the only person who could authorize her entry is the TV station manager, a man who wears glasses and who works on the third floor. Until then Wei will have to wait outside the gate. So Wei goes outside, and the next four minutes of screen-time show her for the rest of the day relentlessly asking every man passing out of the gate and wearing glasses whether he is the station manager. 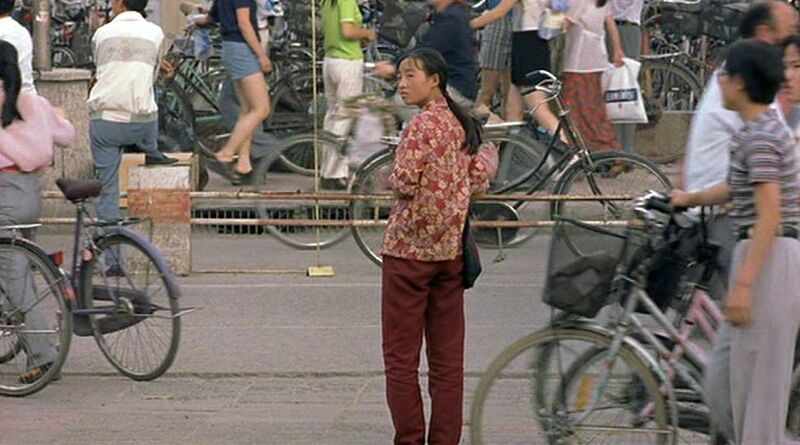 Meanwhile Zhang Huike is shown aimlessly walking the streets and looking for food handouts. Finally a café owner offers him a full meal in exchange for doing some chores. Wei is also shown in the evening looking for leftover food scraps before finally settling down to sleep for the night on the sidewalk outside the TV station gate. The next morning Wei resumes her persistent querying outside the gate, and her endless efforts are finally brought to the attention of the station manager. He sees the opportunity to present a human-interest story and has Wei inserted as a guest on their TV feature show. On the air, Wei is hopelessly tongue-tied; but when the show hostess urges her to look into the camera and imagine she is talking directly to the lost Zhang, she tearfully begs Zhang to come back to her. 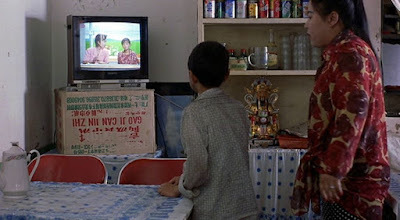 Zhang happens to see Wei on the TV at the café, and he, too, breaks down in tears. Wei and Zhang are finally reconnected. This is the dramatic highpoint of the film, and as Peter Rainer remarked, “it's one of the most improbably satisfying love scenes on film” . Note that this is not romantic love, of course, but rather an altruistic and compassionate love that is an inherent part of everyone’s nature . The scene shifts quickly to shots showing Wei and Zhang on a bus joyously returning to Shuiquan village and accompanied by a TV crew and a truckload of gifts from well-wishers who had seen the TV show. The whole village comes out to welcome them. The final shots show Wei back with her students in the classroom and working together in Wei’s pedagogically effective mode of “collective discovery” teaching. Only this time they are working with some of the heaps of brightly colored chalk that has been given to them. Not One Less stands as a classic, because it reminds us of important and universal aspects of human existence set in an authentic context. Critics A. O. Scott and Jugu Abraham have rightly compared it to and set it along side of Vittorio De Sica's Bicycle Thieves (1948) as one of the great examples of neorealist expression [3,6]. Neorealism, as earlier presented by filmmakers from Italy and Iran – and here by Zhang Yimou – is not just intended to present documentary reality. Its overarching mission is to present fundamentals of human existence in authentic social contexts. As we all know, sometimes our focus on money can divert us from the real path we need to take. New forms of media can sometimes make direct and authentic human engagement more possible – if we focus our usage of these media in the right direction. The mechanization of modern life has had a tendency to sap it of its humanistic elements. Sometimes a more unsophisticated and naively direct approach can lead to more authentic encounters. The importance of collective cooperation is all too often neglected in our modern world that is dominated by selfish utilitarianism. “Not One Less”, Wikipedia, (25 October 2018). “Not One Less, Critical response”, Wikipedia, (25 October 2018). A. O. Scott, “`Not One Less': A Substitute Teacher Is Put to the Test”, The New York Times, (19 February 2000). Peter Rainer, "Not One Less", New York, (n.d.). Kevin Lally, “Not One Less”, Film Journal International, (2 November 2004). Jugu Abraham, “31. Chinese filmmaker Yimou Zhang's ‘Yi ge dou bu neng shao (Not One Less)’ (1999): A marvelous neo-realist Chinese film, ideal for family viewing”, Movies that make you think, (22 February 2007). Matthieu Ricard, Altruism: The Power of Compassion to Change Yourself and the World, Back Bay Books, (2016).